For this month’s “How I Wear My” post, Adrienne of The Rich Life (on a budget) and I decided the colorblocking trend was calling our names! It’s bright, easy, so very cheerful, and what a terrific way to welcome spring. Then I realized I had nothing in my closet that would even remotely work for a post like this, unless I was going to colorblock black and white. And that seemed like not a great choice. Where’s the color, where’s the life? So I would like to thank the J. Crew designer who decided s/he liked the Prada stripes from last year so much that they would do a take on them and make them affordable to boot. I snapped up their colorblocked T-shirt before it sold out online and plan on wearing it all summer long. Thank you J. Crew! I mean, right? Prada colorblocked stripes on the left, featured in Vogue last year. When I saw the J. Crew T-shirt I knew there was something familiar about the coloring. I looked in my tearsheet file and found the inspiration! I wanted a white watch for summer so I recently got this Timex. For the photos, I couldn’t resist adding my daughter’s neon H&M bangles. 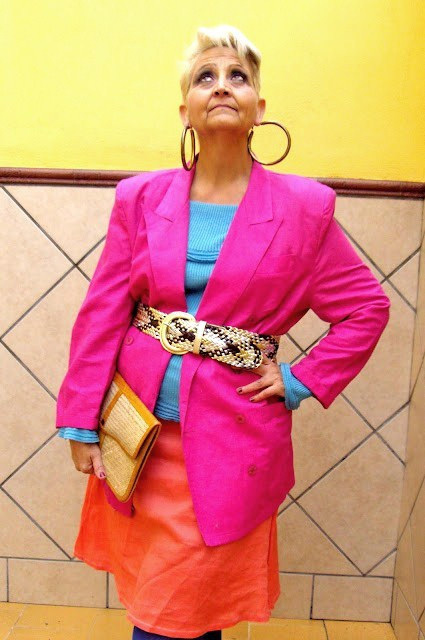 What I love about the colorblocking trend is how it’s interpreted from person to person. The pictures below perfectly illustrate my point and I’m using them to inspire myself to break out of my love of neutrals. Sacramento of MIS PAPELICOS, looking gorgeous in vibrant colorblocking. Bella of The Citizen Rosebud. I was just wondering the other day if turquoise blue and bright red could work together. This answers that question with a resounding yes. 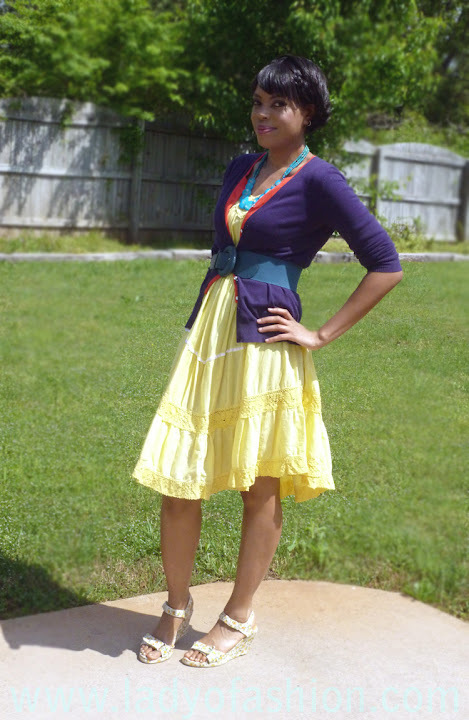 Madison of Fashion Tales used boldly colored layers over a pale lemon yellow dress. Love! Veshoevius of The Taxonomy of My Wardrobe colorblocked dreamy pastels. I am in love with that jacket and do not even get me started on the pleated skirt! Terri of RAGS against the MACHINE. I love this look with the colors, the masculine/feminine mix, and the cards on the tie. It’s so money, baby! Jeannie of Gracefully 50 who is wearing the exact kind of colorblocking I can see myself going for, black and white with a pop of color! 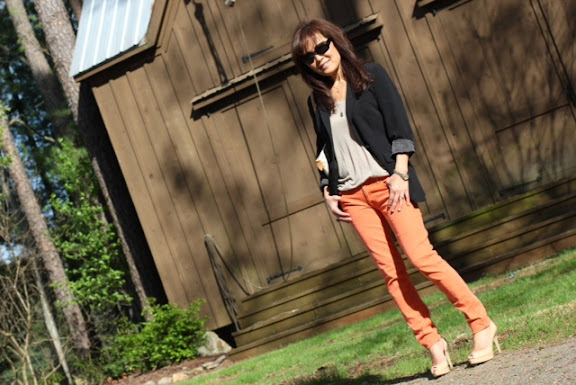 Pam of Over 50 Feeling 40 showing you can use traditional spring colors like coral, green, and khaki to colorblock your look. Jennifer of Seeking Style. I so love these colors put together and after seeing this photo I really want a pair of red pants! 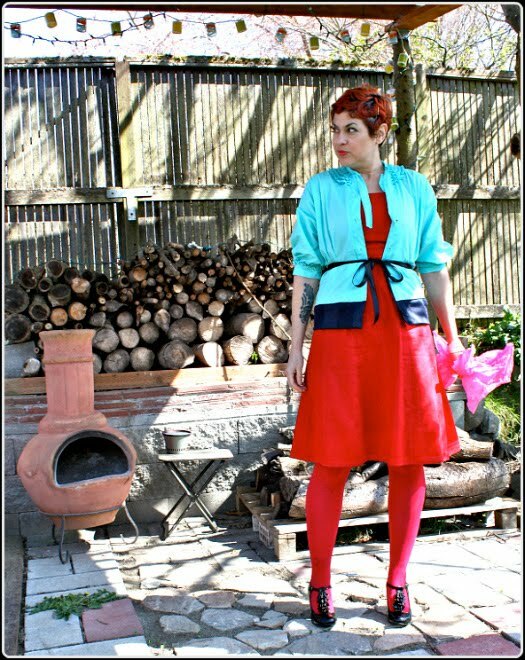 Adrienne of The Rich Life (on a budget) knocking it out of the park in dark pink and aqua. I’m adding aqua pants to my shopping list. Thank you SO MUCH to all the ladies who participated and please head over to Adrienne’s to see what other outfits she colorblocked! Quick, before it’s too hot out (and it may already be for some of you), tie on a scarf, get a picture of yourself in it, and join Adrienne and me for “How I Wear My: Favorite Silk Scarf” on May 1. Feel free to have your scarf somewhere other than your neck—as a belt, around your bag, maybe even on your head! We’d love to hear the story behind your scarf too—is it special to you for some particular reason? The color? The design? The brand? Its provenance? Do share! Everyone looks so fabulous! I have read pants and a cardi that mustard color...I know what I am pairing up tomorrow!! Love your stripes and your background, Jill! What a colorful post! I LOVE your JCrew top and if you didn't already tell us that it's sold out everywhere, I would be on the JCrew website trying to find it. I really can't emphasize how much I like that top on you. We had a lovely turnout this month - so many different looks here. Looking forward to next month scarf post! So fun working with you on this series. This post really got me thinking ahead of time about what I thought color blocking actually meant. I decided that the look needed a minimum of 3 colors and possibly a 4th. That's a stretch for me, as I tend to gravitate toward 2 color looks. I love participating in events like this because I always meet bloggers who are new to me. And I love that you "borrowed" the daughter's bracelets. Oh Jill! Thank you so much for including me here with such a bevy of remarkable women! All rocking out the color block so well! I loved that Prada collection, and think that the J Crew was not only inpsired by it, but also by the inspiration that inspired Prada and that is those collegiate stripes I loved in my preppy phase. Love that J Crew tee... it looks great on you! Nice find. That J.Crew tee is fantastic - So sorry I missed it too. Fun post to see everyone's take on colorblocking! Hi Jill - your J Crew t-shirt is fabulous! What a great find! I wouldn't be able to tell the difference between it and Prada without you pointing it out. And what a lovely post - everyone looks fantastic and there is a lot of inspirational outfits ideas here! All you ladies look awesome!! And Jill, my dear, you look beautiful...great post. Thank you so much for letting me join in on the fun! I adore your shirt! I'm so into stripes this season! Thank you Jill and Adrienne for so much fun. I keep missing your challenges. For what it's worth here is a recent colour blocking post of mine: http://40plusstyle.com/orange-camel-brown-outfit/ Love all these looks! Hi there... We just wamma explain about our company, Pelatihan SDM.